Green shoulders are the most purely cosmetic problem I'll discuss. I have certain tomato varieties --- notably this yellow roma and our pear-shaped "black" tomato --- that ripen the bottom two thirds of the fruit quickly, but leave the top third green. My solution, as usual, is to cut off the tops and give them to the chickens, but I was interested to discover there's a reason for the green shoulders. 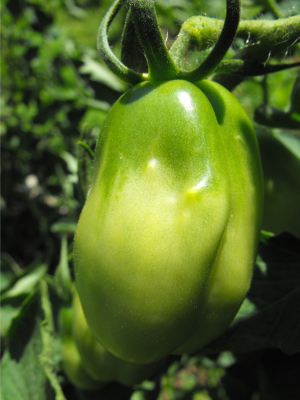 Green shoulders form when tomatoes deal with high temperatures and strong sunlight during ripening. The light and heat prompt the fruits to retain chlorophyll around the stem area, and the "shoulders" often become hard and leathery. Unless you've pruned excessively and removed leaves that would normally shade your fruits, you haven't done anything to cause green shoulders. And there's not much you can do to fix the "problem" either, short of ripening your tomatoes indoors or choosing a different variety. This is definitely one of those times I'm glad not to be a market gardener whose customers demand blemish-free fruit. Learn tricks to turn your invention into a cash cow with Microbusiness Independence.